The snow has finally come to my city to stay (up to my knees after Friday’s dump). Maybe it will get warm enough soon to melt a little, but somehow I doubt it. Oh well, not like I spend a lot of time outside anyhow. :) I’ll stay inside and enjoy winter on multiple fronts from the comfort of my couch. On my own, I’ve been playing The Frozen Wilds DLC for Horizon Zero Dawn and I’m still so impressed with this game after all this time. What a joy to play and so pleasing to the eyes. Definitely a poster child for HDR in gaming with all those lights flashing around in the darkness. It is weird to be playing Horizon Zero Dawn while also playing Breath Of The Wild with my kid. Horizon has me with the storytelling, the combat, plus the visuals and audio...but Breath Of The Wild might be my new favourite for exploration. I hope Breath Of the Wild’s navigation structure will influence future video games, I really need to see that type of cartography in all my future RPGs. 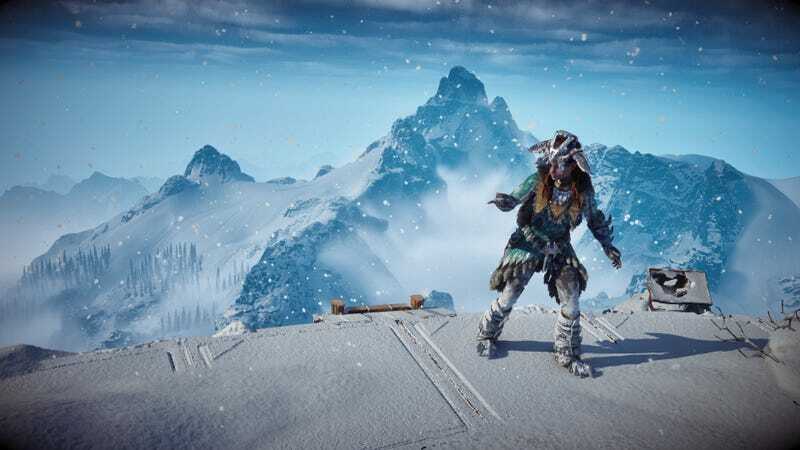 The Frozen Wilds DLC takes place in the new icy northern regions of the game’s world. It was weirdly coincidental to be walking around the snow in-game just as my real world suddenly turned white. Frozen Wilds is staggering as a winter wonderland and the crunching snow sounds beneath your feet are some of the best I’ve ever heard. The entire game sounds incredible and I love how much hunting you can do with your ears alone. Sony has done a great job of fostering a culture of excellence in sound design across their game division; all those movie and music assets have really paid off. Where the illusion comes apart in The Frozen Wilds is the poor representation of being cold. Aloy will drop one-liners complaining about the cold, but there are no penalties for lack of clothing or sense of danger from the weather. Breath Of The Wild kills it with the effects of the local climates. I think being Canadian makes me extra aware of the scary parts of being cold, but nothing pisses me off more than characters jumping into the water of freezing environments with no penalty. BotW is fantastic for making the player feel the cold. You see your breath freezing in the air and, if not properly protected, your character will shiver painfully and eventually die from the elements. (and the cold water is extra dangerous too!) The varying effects of the different environments in BotW help the world feel so much more alive than something like Horizon’s deserts and tundras, even though Horizon is visually more realistic than most games out there. My wife and I are playing The Last Of Us again, but this time on the PS4. We finished it on the PS3 and loved it, but it is definitely a better experience on the PS4. We are enjoying the game all over again and I think it still has one of the best playable openings in video games. I had forgotten how tense and depressing this game could be. I *tried* to spell “TAY” in the snow of The Frozen Wilds. I’m looking forward to continuing my gaming with my family this weekend. I’ve finished off The Frozen Wilds main story and I had a blast with the campaign and all the challenging bosses. I was planning on picking away at some of the hunting missions and other bits I missed the first time around, but God Of War for PS4 just dropped sub-$30 in Canada on the PlayStation Store, so I imagine I’ll be doing that instead. I was hoping to give my hands a break from the PS4 controller after all the pounding of Horizon, but the heart wants what the heart wants.